Every region of England and Wales apart from London is happy to leave the European Union without a deal if no agreement is reached by April 12, a poll has revealed. In the Midlands and Wales, 46 per cent favour no deal, while 31 per cent want to Remain, according to the research by YouGov. In the South, 44 per cent back No Deal and 34 per cent are for remaining in the EU. In the North of England, 41 per cent back No Deal and 34 want to remain. However in London, only 26 per cent back No Deal and 48 per cent want to remain, the research found. The results in Scotland mirrored London, with just 28 per cent in favour of No Deal. Most Conservative voters also now want to leave Europe without a deal, the poll found. 72 per cent of Tories wanted no deal, with 15 per cent saying Article 50 should be revoked. Asked whether in hindsight, Britain was right to leave the European Union, 29 per cent of Londoners voted yes, compared to 46 per cent in the rest of the South and 48 per cent in Wales and the Midlands. While none of the regions flattered the government in their views on its EU exit negotiations, the rest of the South was three times more forgiving than London – with 9 per cent responding that negotiations were “going well” – compared to just 3 per cent in London. Wales, the Midlands and Scotland fell somewhere in between with 7% and 6% respectively. London was similarly harsh in its support for the PM’s draft Brexit deal. While 30 per cent of respondents in the South said they supported the draft deal, only 13 per cent in the capital felt the same. This morning, Health Secretary Matt Hancock said a no-deal Brexit is now “very unlikely” as he suggested he could accept a customs union compromise. He said that, while he “profoundly” disagreed with Jeremy Corbyn on economic and security matters, he believed the only remaining way to get Brexit through was by seeking Labour votes. But Mr Hancock said he was “very, very strongly against” a second referendum – despite Chancellor Philip Hammond describing it as a “perfectly credible” proposal. Asked about the chances of a no-deal exit, Mr Hancock said: “I think that they are very unlikely because of the Bill that the House of Commons passed last night. “The Bill isn’t law yet – it has to go through the Lords – but we all know that the House of Lords is very, very opposed to no-deal and that would make it the law of the land that the Prime Minister has to seek an extension rather than go for no-deal. “In our most recent poll we looked at what the public think should happen in one of the situations that could lead to a no-deal Brexit. “That is if Parliament remains deadlocked and the EU refuses to give Britain an extension. 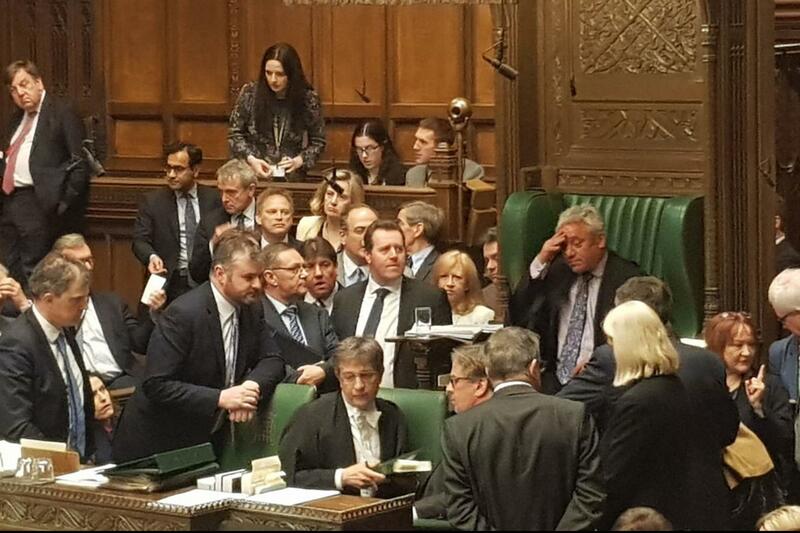 It comes as Tory Brexiteers reacted with fury as a bill aimed at forcing an Article 50 extension to block a no-deal outcome was passed with a majority of just one vote. The cross-party Cooper-Boles Brexit Bill, which was fast-tracked through Parliament in one day, was approved by MPs with 313 vote for and 312 against late on Wednesday night. Expressing his frustration at it clearing all stages in the Commons within a matter of hours, Conservative MP Peter Bone urged Speaker John Bercow to “make this farce stop” and prevent further votes. 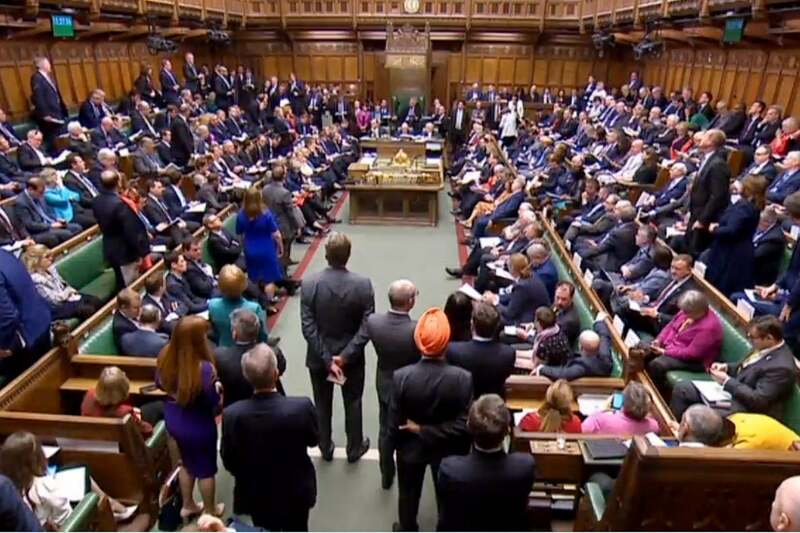 Speaking after the result Yvette Cooper, who drafted the bill, said it has been a “very considered and thoughtful debate throughout”, and that MPs had “voted again to make clear the real concerns that there would be about a chaotic and damaging no deal”. She said the Bill would “support the Prime Minister’s commitment to make sure we don’t end up with no deal on April 12”.